Hot tears leak unwanted from my eyes. They trickle down the side of my face and into my ears making the teacher’s voice a little distorted. I’m lying in savasana, corpse pose. Some say it’s their favourite yoga pose. How can that be? What do they find there that eludes me? Some say it’s the hardest pose of all. That sounds closer to the mark. Certainly today. I don’t want to be here. My mind squirms and wriggles, wanting to break free. My body is more disciplined and stays still. And all the while I can hear the teacher stalking the room. The theme of the class has been about questioning our beliefs and waking up in our lives. What is reality? What is life and what is death? What is the self? Do we believe in an immortal soul? The teacher touches on Buddhist notions of the non-existence of an unchanging soul or anything eternal. She asks us to examine our beliefs critically, not to move through life unquestioningly. This doesn’t feel like a good theme for me. I ask myself these questions too often, till I’m weary with wondering. ‘Waking up’ for me sometimes feels less a gradual process of increased awareness, and more a repeated shattering sudden consciousness as if a loud alarm has gone off. And Groundhog Day style — over and over again. So I practice sitting with these questions, learning to allow them to remain unanswered. I don’t need to be told to ask them! I know I don’t want to confront the idea of death. I feel too vulnerable already. My practice often leaves me feeling flayed, stripped of my protective layer of comfortable habits, raw and exposed. Please just let my savasana be a gentle unwinding, a quiet gift of gratitude to my body. I feel uncomfortable enough. I don’t need to be prodded harder into enquiring after the great truths. I reflected on all this as I travelled homewards on the train, allowing my feelings to settle. 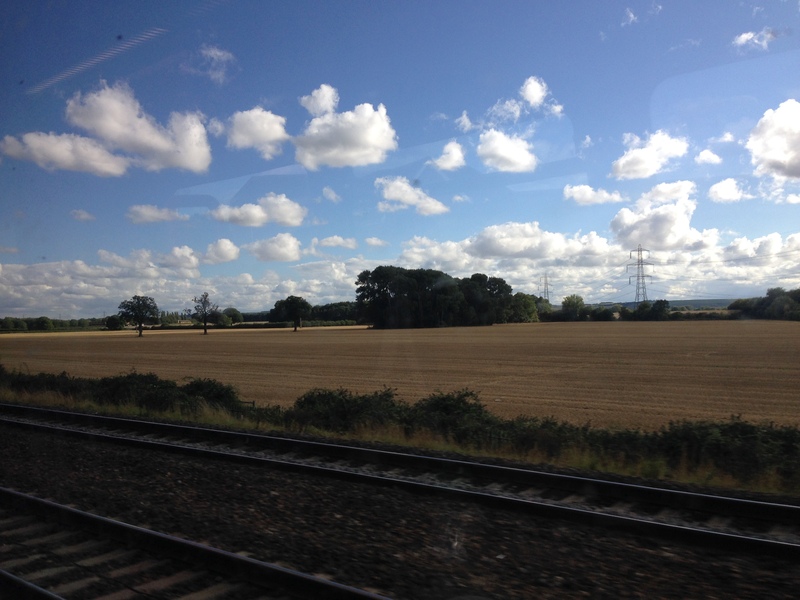 The landscape slipped past me, fluffy clouds hung in the late summer sky. I admired the textures of recently ploughed fields and the multitude of green colours nature provides, with each tree a rich palette of just a single shade. I felt childlike in my joy at these things, as if I were seeing them for the first time. I can’t confront death. I’m feel I’m only just starting to live. Corporate yoga — it’s not what you think! So good to hear your experience of this guided savasana. I have on occasion used savasana as a reflection on final dissolution. And I used to keep a skull (affectionately named “Yorick”) on my desk at school (until someone stole him). For some reason, I like to keep death at my side… I figure that it helps me to engage more deeply in life. But obviously, this isn’t everyone’s experience, and it’s very good to be reminded of this. I suppose sensitivity is a must with this topic. You never know if you have anyone recently bereaved in class. So beautifully written as always. I had a class recently on grief death and dying, and the teacher asked us- “who here knows you are going to die?”. Everyone raised their hand. Then he said “who here believes they are going to die?”. No one raised their hand. I’m not sure whether it is better in life to believe it or to not believe it? Or if we even can truly believe it? what do you think? Your class sounds interesting — nice difference between intellectual understanding and emotional acceptance/belief. It’s clearly got you thinking! I suppose whether it’s better to really believe in death depends on how that benefits you during life. For me yesterday it just felt upsetting. I can see, though, that for others exploring this theme might be the thing to jolt you out of complacency and the life-as-dress-rehearsal feeling. I wonder if truly accepting one’s own mortality happens only under pressure of circumstances (e.g. a terminal diagnosis) or by intense contemplation and practice. It’s not a practice I want to commit to! 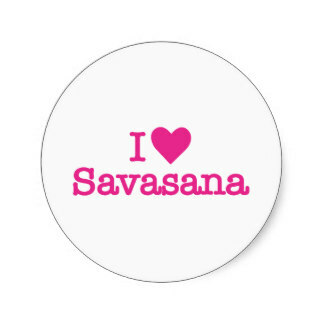 I might be wussing out by seeing savasana as a relaxation but I think that’s what I need. That’s a hard enough practice for me!! A few years back my father and father-in-law passed away within 5 days of each other. My dad’s death was sudden and my father-in-law’s expected but not soon after my dad. Those days, I had a lot of death on my mind and it was actually quite cleansing to see how much I held on to stuff that was not relevant. Ramana Maharishi was someone who contemplated death and figured out his path. A really good book is The Tibetan book of living and dying to explore this theme. Thanks for the thought. I’ve not read the Tibetan Book of Living and Dying, though I have come across it several times recently… One day I’ll check it out. When I feel more ready to explore the theme. Today isn’t that day.